Excuse me, Amigo, but is it possible for you to direct me towards the nearest taco stand, please? My poor mother is hungry, and she wants to eat something tasty whilst watching this 76 minute movie made in 1951. It was Directed by: Irving Reis; and Starred: Lew Ayres, Marilyn Maxwell, Ted de Corsia, with Andy Devine. 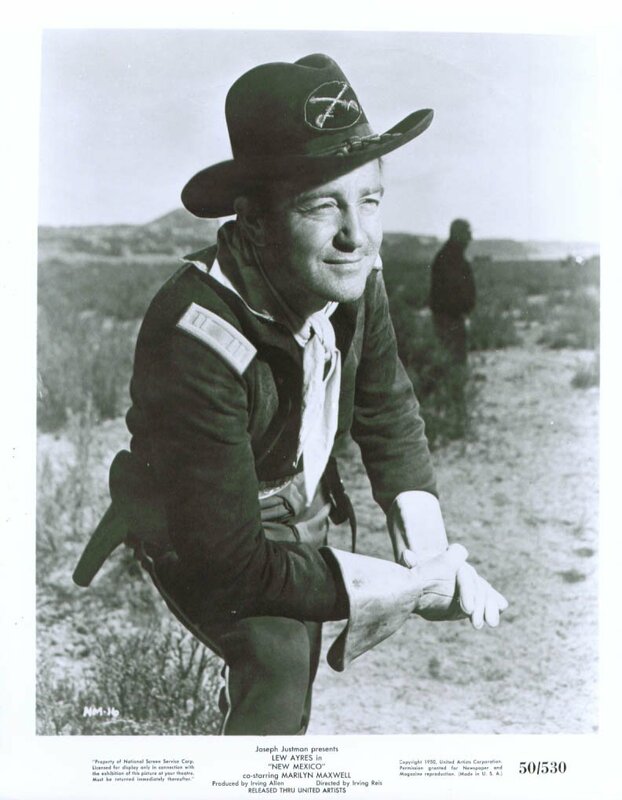 Each of us has to do whatever we must to survive, Captain Hunt (Lew Ayres). You and your army of men have to chase after us for crimes you know are unjust. Whilst me and my tribe have to defend ourselves for the exact same reason! Having said that, though, things weren't always like this between the two of us, were they? Many moons ago I signed a peace treaty with your president, Abraham Lincoln, just so that our two nations can live in relative harmony. But then, because of the way your corrupt corporal treated my brothers-in-arms, we both eventually found ourselves in the terrible situation we're currently placed in. With me and the Sioux nation ready for an attack, and with you and your army hiding behind a big Mountain: with no food, no water, and with hardly any bullet's left in your gun's. Still. That's most probably why what next transpires has a pow-wow when I say to myself, 'Chief Acoma (Ted de Corsia), lets see how this all plays out'. As a dead boys death causes his brother to dwell - Cherry (Marilyn Maxwell) seams like a very nice girl - gun's and ammunition's are found down a well - and at the end of the day, this film doesn't end so swell. 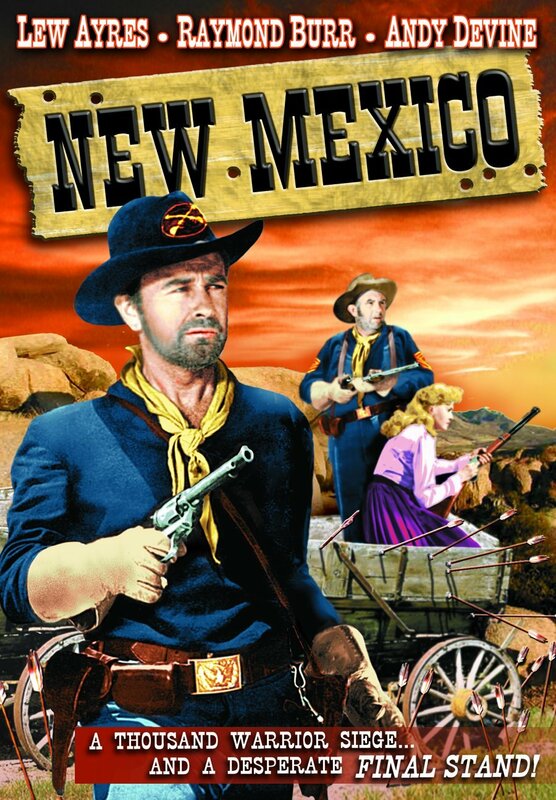 Now if you can look past the piss poor production values plus some those scenes where people kept on shooting off into thin air, you'll find that at the very heart of 'New Mexico', is a rather solid tale about two men who are both different sides of the same coin. Well, let's face it. We all know that America has swiped a lot of land from the Native Americans in the past. And that sometimes some of the people who were put in charge of this 'theft' weren't very nice characters at all. Yet, whilst saying that, there were some nice people too. And they did attempt to oppose this stance, despite the very cruel shenanigans they were ultimately placed in. Take Lew Ayres role in this movie for instance. From the get go you know for a fact that he's a very just man, and that he does feel some sympathy towards the character Ted de Corsia plays. But he doesn't show this by looking off into the distance and wondering what he can do to save the day. Instead, he allows his erstwhile actions to dictate his demeanor, without coming across as being too 'poor me' or too 'company man' by default. Also, something else about this flick I really liked, was how it told a very simple situation in a no nonsense manner. Granted, a few of the scenes were a mite superfluous in hindsight. Especially those that followed on from the initial 'siege' set-up. However, apart from this slight gripe, I did get a perverse form of enjoyment out of that poor boy who wanted to kill that cruel soldier for shooting his brother. Plus, as I said previously, I have to applaud Lew and Ted for carrying the weight of this picture upon their collective shoulders, because they both appeared stoic, brave, and honorable, without seeming too 'showy' or too 'mundane'. Anyway. By now I'm sure you can tell that I did enjoy sitting down and watching this timely black and white movie. So for the time being, please stand back and digest the following filmic facts. 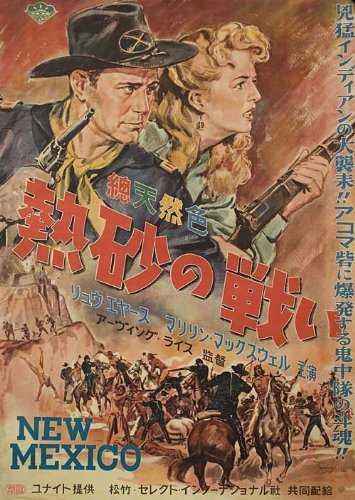 (1) 'Irving Allen Productions' first released this adventure in America on the exact same day the United Nations first moved their headquarters to New York City -- the 18th of May, 1951. (2) Loosely translated, this project was entitled 'True Men' in Brazil; 'The Death Rock Colorado' in Austria; and 'Flaming West' in Finland. (3) Apart from those scenes shot at Iverson Ranch, Los Angeles, California, the rest of this movie was shot on location within the American state of New Mexico. This includes Albuquerque, Gallup, and Santa Fe. (4) The director of this picture, Irving Reis, was in the business between the years 1925 to 1952. And during that time he's directed such classics as 'The Bachelor and the Bobby-Soxer', starring Cary Grant; 'All My Sons', starring Burt Lancaster; plus 'The Big Street', starring Peter Fonda. (5) A few years after he co-produced this western, Irving Allen relocated to England, and formed 'Warwick Films' with the mastermind behind the James Bond film franchise, Albert 'Cubby' Broccoli. (6) Max Trell was the writer that came up with the original screenplay for this flick, and he's best known for writing children's stories syndicated from the late 1920's to the early 1950's. (7) The tagline used to promote this picture, was, 'ARROW-STREAKED ADVENTURE! BULLET-SCARRED STORY!!!'. 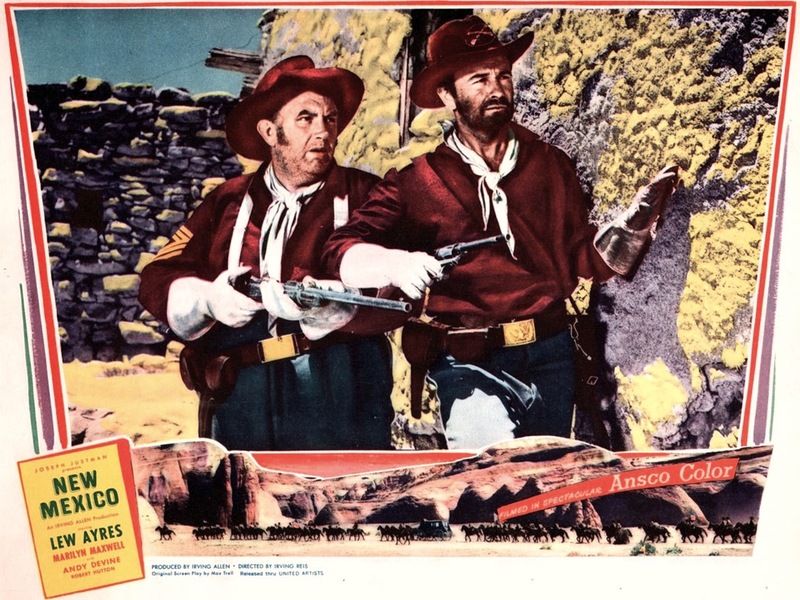 (8) After this movie gulped its last nacho, Lew Ayres starred in the crime-drama, 'No Escape'; Marilyn Maxwell starred in the comedy, 'Off Limits'; and Robert Hutton starred in the western, 'Slaughter Trail'. 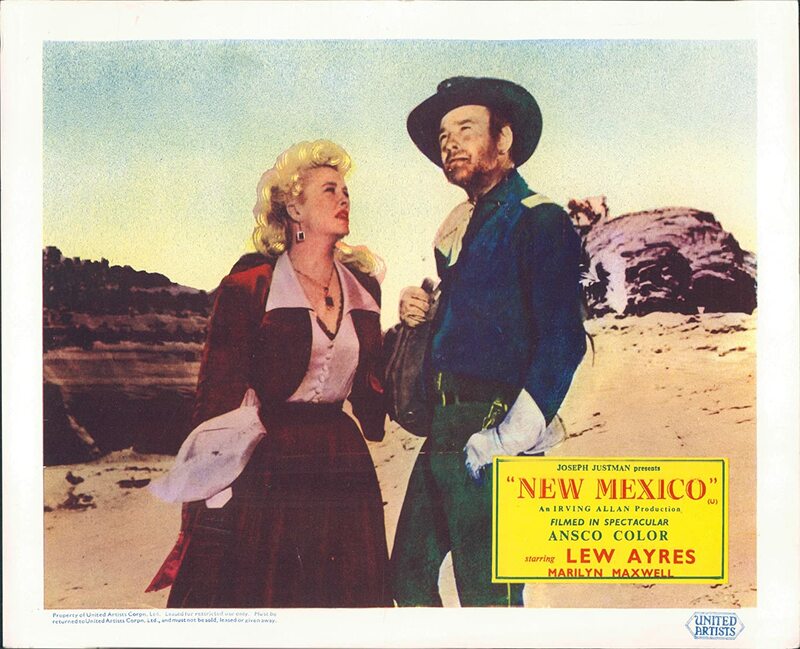 Overall I'd say 'New Mexico' was one of those films that said more than it was able to for its time. Most of the cast did a bang up job of playing their respective roles. Some of the camera work wasn't bad to look at, in spite of it being mucky and dank in places. And by in large I'd love to see this adventure re-made soon, but only if the makers could maintain its stoic vibe and it's no nonsense attitude.